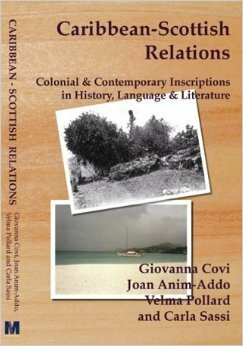 In this book, Joan Anim Addo, Giovanna Covi, Velma Pollard, and Carla Sassi present the results of collaborative research on colonial and postcolonial relationships between the Caribbean and Scotland, promoted by the University of Trento, Italy, and coordinated by Giovanna Covi. The four essays focus on the historical, cultural and literary representations of various aspects of this complicated interconnection: Joan Anim Addo’s on family history, Giovanna Covi’s on identities in African-Caribbean literature, Velma Pollard’s on Jamaican history and language, and Carla Sassi on Scottish literature. They discuss pivotal figures such as Mary Seacole, Charles and Hugh Mulzac, and texts by Walter Scott, Robert Louis Stevenson, James Robertson, by the anonymous Author of Marly, and by Una Marson, Claude McKay, Olive Senior, Jamaica Kincaid, and Nourbese Philip among others; they give voice to Juliana Mulzac through (auto)biography and to numerous other people through interviews and acts of re-memorying.